Duane and Deanna began ministry together as Bible teachers in their local church and have been involved in teaching the Bible since 1961, which is also the year they married. They have three children and six grandchildren. 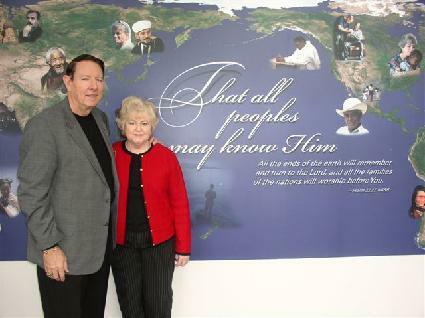 For the past 16 years Duane has served as International Director of Missions for a large international ministry. Deanna assisted him, as well as led women’s ministry. Preparations for large gospel celebrations included counselor training, schools of evangelism, youth rallies, speaking in schools, women’s seminars, seminars for pastor’s and wives, men’s seminars and preaching in churches. This ministry has taken them to 67 countries sharing the gospel with well over 1 ½ million people. Duane received his B.A. from Oklahoma City University and a M.A. from Tulsa University. Prior to going into full time ministry, he attended Southwestern Baptist Theological Seminary in Fort Worth, TX. Duane has served two years as President of The Fellowship of Baptist World Ministries. This organization is an autonomous group of 37 ministries working all over the world in covenant relationship with the International Mission Board of the Southern Baptist Convention. Duane is also a member of the Oklahoma and National Conference of Southern Baptist Evangelists (COSBE).